POSTURE is the ability to balance your body in proper alignment. The more aligned you are the more balanced your are…therefore, the better your posture is. Proper alignment is having your head balanced over your shoulders, with shoulders/torso over the hips/pelvis, and the hips/pelvis over the feet/ankles. The better the alignment… The better the muscles work at moving the joints…which in turn moves our bodies more efficiently and without pain. Posture is so important…yet so many people have poor posture and do not realize the wear and tear “mechanically” poor posture has on the body. Remember this: We will look “old”, move “old”, and feel “old” if the majority of us don’t start working correcting some postural habits. Poor alignment is poor balance. That does not necessarily mean your are stumbling around…even though some people are more prone to stumbling around. What poor balance does mean…is when being out of alignment the brain tells the muscles to work differently in order to adjust for the malalignment. Now, the joint is moving differently which after time can cause wear and tear on the joint and some muscles to become overworked and some muscles not being worked enough or even at all. This is how muscle imbalance develop and become worse. We all have muscle imbalances! I have them. They develop over time from poor posture, poor movement habits, repetitive movements, sitting to much, injury, sports and even gravity. If you want to age better, perform better, look better, move better, feel better…learn about your posture and your movement habits! Contact me anytime to look at your posture and start changing the way you move. LOOK WHAT FOUNDATION TRAINING CAN DO! Take a look at these pictures. The “before” picture is of a young woman with to much weight on the balls of her feet, to much anterior pelvic tilt, internal rotation of the shoulders, arms & hands. Very forward head and neck causing that strong curve in her neck. This woman is way to you to have poor posture like this. What is so astounding…so many people are walking around like this! Working like this! Playing like this! These poor positions lead to pain. These poor positions are muscle imbalances in action. Most people have no idea what their posture looks like or how they move. It does not have to be like this! Let’s look at picture number two. Same young woman with some adjuments. Look at the difference! When the body is in good alignment it moves better mechanically. The muscles function as the are supposed to in order to move the bones. If the bones are moving well…no friction. In poor posture like the picture above…her neck and shoulder muscles are over stretched causing strain. This causes those muscles to weaken. The brain will call upon other muscles to help take up the slack. This is how muscle imbalance is created. Over time this can become crippling to the body. FOUNDATION TRAINING is the bomb! I have been talking about FT for nearly two years now. I still know FT is special. FOUNDATION TRAINING will teach you body awareness, correct posture, correct muscle imbalances, strengthen and lengthen the posterior chain muscle groups, and change your life! I know this because it has worked for me, people I have taught and I have seen many of my FT colleagues from around the globe help so many people. Healthcare is changing… Become proactive with your body and your health. Learn Foundation Training! 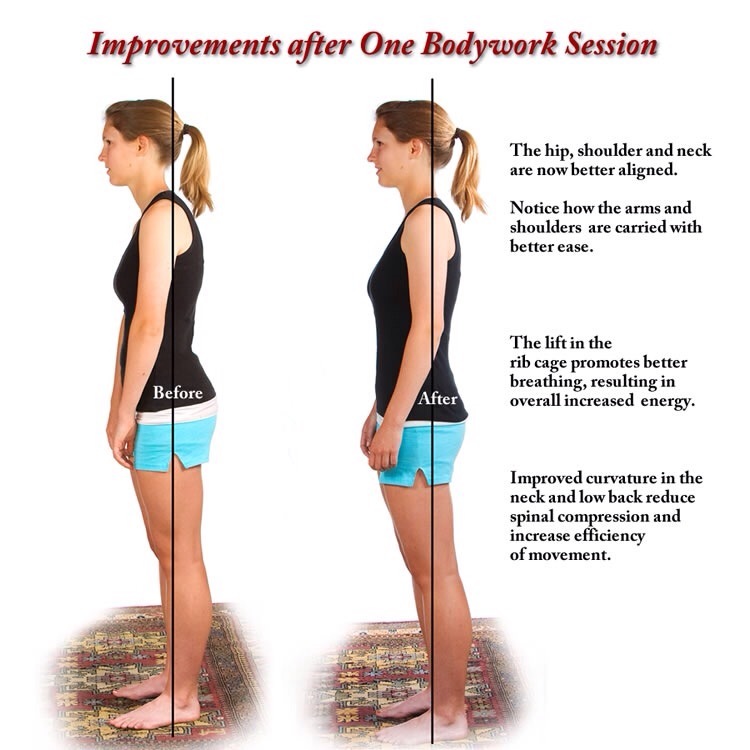 Good posture is good health… Posture affects many areas of the body…internally and externally! I hope to see you Sat May 16 at the Flowood YMCA for a posture check. Get a posture picture taken and looked at. Come learn about “your” body. Good health starts with good posture!